WASHINGTON — Orbital Sciences Corp. beat outseveral other finalists to win a NASA Space Act Agreement award worth $171million to build and demonstrate a launch system capable of delivering cargo tothe international space station. NASA madethe award under its $500 million Commercial Orbital Transportation Services(COTS) program, which is aimed at stimulating privately owned alternatives tothe space shuttle and other government systems for ferrying crew and cargo tothe space station. The U.S. space agency intends to hold an open competition in the years ahead for actual space stationcargo-delivery contracts, but Orbitalof Dulles, Va., is one of two companies receiving financial help from NASA todevelop their proposed systems. The other is SpaceExploration Technologies of El Segundo, Calif. The $171million NASA awarded Orbital Feb. 19 became available last fall after theagency ended its COTS agreement with Rocketplane Kistler when the latter wasunable to raise the $500 million in private financing it needed to finish itsK-1 reusable rocket. Rocketplane Kistler of Oklahoma City and Space ExplorationTechnologies were the original COTS awardees. NASAcurrently depends on the space shuttle and Russian Progress spacecraft todeliver supplies to the space station. 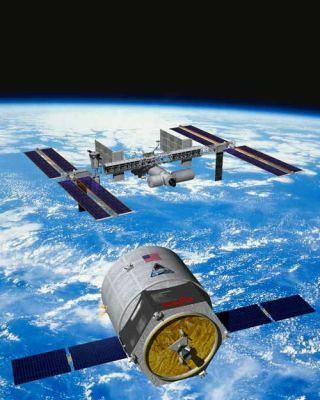 After the space shuttle retires in 2010,the space station will be dependent on European, Japanese and Russianspacecraft for logistics until NASA?s Orion Crew Exploration Vehicle or a U.S. commercial alternative enters service. With Orionnot scheduled to make its debut until March 2015 and no guarantee that the U.S.private sector will succeed in fielding a commercial alternative, NASAAdministrator MikeGriffin asked Congress Feb. 13 for legislation this year to permit theagency to place a new order with Russia later this year for additional Progressunmanned supply ships and Soyuz crew capsules. NASAalready has agreed to buy roughly $700 million worth of such services from Russia through 2011, when a temporary congressional waiver of the Iran-North Korea-SyriaNon-proliferation Act is due to expire. The law prevents NASA from buying spacestation-related goods and services from Russia as long as that country?saerospace sector continues to help Iran acquire missiles and other advancedweapons.